Very unique bags. Super stylish. Thanks a lot CEP. Will be purchasing for of these for my business in the near future without a doubt. The perfect product to help promote my business. Even have my own bag because I love them so much. Thank you Custom Earth Promos. Very cute eco-friendly foldable bag. Love the zipper right above the logo you guys designed for me that came out amazing. Thanks CEP. My company wanted me to place an order for these bags in a bulk order. The logo really stands out on this bag. Will be doing business with you guys again. Very pleased with my purchase with Custom Earth Promos. The eco-friendly attribute is a huge different maker in my decision to roll with this company. I customized the logo with a couple different colors and it came out the way our design proof looked. I was impressed and would order more bags from custom earth promos. Loved the material! Was very happy with my purchase! Thank you CEP! This bag was received well by everyone at the showcase, the bag made us look good. I would partner with custom earth again based off this first order. Folds toegther nicely. Easy to hand out this bag when all folded plus the logo is still visible when folded. Quality bag, You have seen bags like this around, this is the website to buy them. I wouldnt trust any other site. Custom earth promos is a professional company. Cant beat it for the price you get this model bag at.. They worked with me for the large quantity I ordered. In Cali you have to use reusable bags for everything groceries, shopping etc. That is how I found custom earth promos on the internet. I was in need for some reusable bags and now I order 5 different models of there bags for my store. This is the generic folding bag that I use for my store. It is a good bag and will hold up well the material can also be washed. They make quality reusable water bottles as well as bags I ordered both for an upcoming event, our logo looked great on each item. This bag was a nice touch to package the water bottle. We ordered thousands only problem we saw and it was only on a couple was the zipper, which is normal for a mass quantity wholesale order. I only use eco-friendly products from paper to our cleaning suppplies at our office, it was the next logical move to start using custom earth promos for all of our advertising and promotional needs. Nothing bad to say they are a good eco friendly company. Love this bag, it has helped me support my organizations cause in so many ways! Good bag I suggest this model very affordable and durable. The print on the bag looks good and is actually in the right spot. The zipper and folding of the bag works as well. Its nice to have a bag that is what you would expect it to be. I would order this again. From first call to final delivery this was an easy process. I suggest this bag and company. This bag has boosted my sales. I hand it twice a year and all of our customers love it. Nice size you can fit tons of items in the bag despite it being a fold away. Clear graphic, folds and stores nicely, just placed a reorder for this reusable bag because everyone loved the bag the first time around. It is a good bag, you will not be dissatisfied. The handle is strong despite the material being polyester. I was shocked by this because I have had bad experiences with polyester material made items. Tactical use of promotional products to increase brand exposure is a strategy used by the most successful businesses in history. Stand out and stay ahead of your competitors by taking a modern and eco-responsible approach to growing your business with reusable custom bags by Custom Earth Promos. By proudly marketing your business with a company logo or slogan imprinted on an eco-friendly custom bag, your brand becomes a testament taking an action for environmental preservation. Custom Earth Promos' cost-effective and super stylish Reusable Folding Custom Bags will engage your customers and gain the attention of prospects everywhere they go. A large sized bag that is quickly and easily stored entirely by snapping into its own pocket, the convenient foldable design of these totes provides customers with an excellent option for shopping, beach trips, picnics, get-togethers, and the gym. Everywhere your customers happen to carry these convenient folding totes will build brand visibility and recognition. The versatile design makes these bags a stellar choice for promotional giveaways, product launches, loyal customer rewards, holiday sweepstakes and gifts for employees. Be sure to take advantage of our second optional imprint location to optimize your brand exposure with a custom graphic display on each side of the bag. Utilize imprint(s) of custom texts and slogans to support a cause or promote your latest product or service. Explore a wide range of customization options with our design team to build an order of Reusable Folding Custom Bags that appeals to your specific target demographic. With a multitude of options for personalization, these bags are versatile enough to meet the needs of any business, charity or cause. The large one-piece construction and foldable design is especially popular among hotels, departmental stores, fitness chains, retail chains, spas, and resorts. When placing your order for Reusable Folding Custom Bags with Custom Earth Promos, you have your choice of four vibrant colors of accent pockets black, navy, process blue or red to perfectly accentuate the natural cotton tote. Choose just one color that best complements your company logo or mix it up by including two or more different colors in your order. The convenient folding design makes these totes an instant go-to for beach trips, picnics, gym bags, day trips and grocery shopping. With so many available everyday uses and two possible imprint areas, your folding bags are guaranteed to increase the exposure and build awareness for your brand. Reusable bags make a great opportunity to promote a new product or service, support corporate events, company milestones or holidays. Another effective option, reward return customers with these complimentary gift bags as an incentive for their brand loyalty. 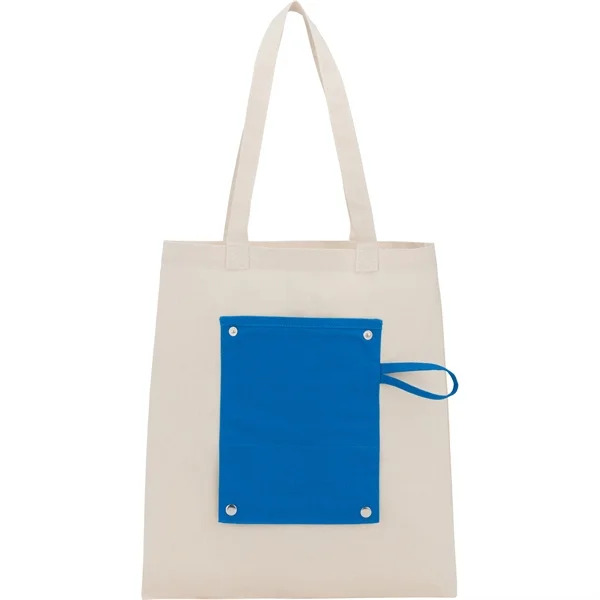 Present employees with an eco-friendly and convenient tote that will inspire a company culture devoted to the future of our planet and cultivate a proud, united team. Customize your bags with head-turning imprint graphics that accurately express your brand values. Our expert design team will walk you through the multiple custom options or work with you to define an exclusive graphic that is unique to your brand. When working with Custom Earth Promos, you'll receive assurance that your promotional product order will be guaranteed as safe for your customers and the environment. Our products each undergo stringent testing to ensure that they do not contain any of the harmful carcinogens or metals listed under the California Proposition 65. When you order direct overseas with Custom Earth Promos, the freedom is yours to build an order of Reusable Folding Custom Bags from scratch. Stand out of the crowd and stay ahead of your competition by utilizing additional features that appeal to your target audience. Get premium graphic imprints with our edge-to-edge printing option or choose a unique matching fabric color that complements your brand logo. We can even customize your order with additional pockets and insulation or contrast colored handles for a bolder look.